Perfect for practice, our top quality, durable, portable modular putting greens are fast and easy to set up and dismantle. 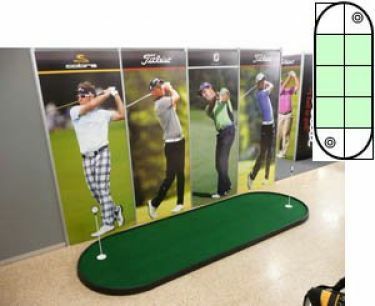 Suitable for use indoors or out, they great for golfers of all standards and ages. Perfect for practice, our top quality, durable, portable modular putting greens are fast and easy to set up and dismantle. Suitable for use indoors or out, they are complete with pre-cut artificial golf turf, regulation hole cups, and contour pads. Great for golfers of all standards and ages. The Huxley® 4 x 10 Putting Green is a modular system delivered in kit form with everything you need to set it up quickly and easily.